Remember a few weeks ago when I shared my tutorial for the Zipper-Cape? Near the end I mentioned that I had some navy blue fabric that I wanted to use for another scarf so.... I did, but this version is BIGGER & BETTER and I am going to tell you how to make one too! Take a look at my versatile creation- the Gold-Zip Trim Scarf! - 49.0" Width x 61.0" Length piece of fabric (finished size is 24.0" W x 60.0" L). Start with fabric folded wrong-side out and pin edges together. Then, sew the 60.0" length and one of the 24.0" sides. Be sure to leave one of the 24.0" sides unsewn. Pull the fabric right-side out through the open end, pin edges, and sew the last 24.0" side together. The step is adding the separating zipper in. Start by unzipping and separating each side and pin in place. You will add one side of the zipper 4.0" from the 24.0" end. The other part of the zipper will go on the reverse side of the scarf along the length 4.0" from the top edge. Then stitch both in place. Not too tough right? Now start playing! Zip, loop, twist, drape, wrap, and whatever else as you figure out your favorite ways to wear it. Here are some of my favorites! You probably already know this, but I am a sucker for anything that you can wear multiple ways or has added functionality, so I'm definitely Head Over Heels for this DIY! What do you think of the Gold Zip Trim Scarf? Here are the links to my other Multi-Wear Scarves if you are up for some more sewing! 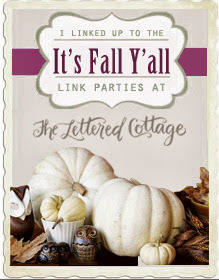 Linking this up at The Lettered Cottage's Fall Craft Party!